Now, more than ever, mom’s are opting to home make their baby’s solid food. There is a large concern today about the quality of produce used in baby food and the dangers of genetically modified organisms. The good news is you have tons of options! Homemaking baby food is super simple and can be made in bulk in one afternoon. What about when your baby turns into a toddler? Sometimes you need a quick on the go snack that’s packed with good, healthy, real food! I was always a fan of Plum’s “Tot” pouches called the “Mighty 4”. These are amazing sources of protein, calcium, and vitamins in a small 6 ounce pouch. They are great for road trips, fast snacks, quick grab at the zoo, BUT they are not easy on the bank account. One of these Tot pouches runs any where from $1.49-$1.99 depending on which pouch and what store you buy them at. Even when on sale they still leave a huge hole in your wallet for buying just 10! Here is your fix to the money problem: If you haven’t already, go to Amazon and buy reuseable food pouches. Research because there are MANY types!! I have 10 of the 6 ounces and 20 of the 8 ounces. There are many different brands so try to look for 1. dishwasher safe and 2. BPA free! Or, you can use disposable ones as well. I have done both. About $15 worth of produce and food items will make thirty five 4-6 ounce food pouches! For us that’s almost a full MONTH worth of food pouches! The produces costs us around $15 and the reusable pouches were $14. 35 Plum Tot Pouches would costs us $55.65 and you can’t reuse the pouch! Making your own homemade food pouches (homemade tot pouches) is so much more economical. Don’t forget you can scroll down for a printable version!!! OPTIONAL 2 cups of cooked broccoli . I used broccoli because my child won’t drink any type of milk any longer no matter how often we try. Puree your bananas, milk, and almond butter. Finally, fill your food pouches and store them! I keep a couple in the fridge and put the rest in the freezer. Every night I take a couple out to thaw because my kid goes through 1-2 a day! These food pouches will last 3 days in the refrigerator and 1 months in the freezer; although they only last about 3-4 weeks in our house. This recipe is quick, simple, and best of all you know every single ingredient in them. Because you home make these and store them in a freezer there is no need for preservatives to keep your produce, yogurt, and milk fresh. The “tot pouches” we buy at the stores have to have preservatives in them so who knows how long the fruit has been sitting up there. This way you know your toddler is consuming organic and fresh produce made by mom (or dad). 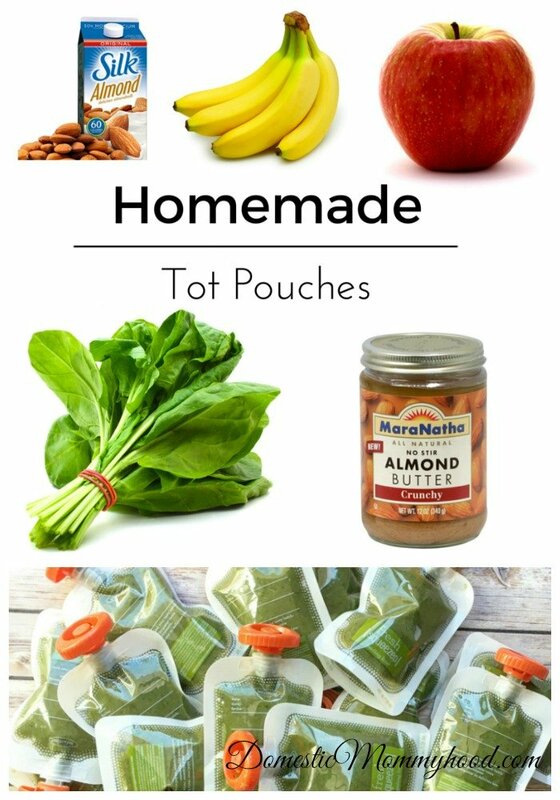 Homemade food pouches are much more affordable and healthier for your toddler’s growing body!